Is this the new British Airways Club World seat? Reader Dave left a note in our comments yesterday which I found interesting. I wrote an article highlighting a BA survey which implied that Club World could be getting private suites with doors. Some extra information sent to me by a reader suggested that I was on the right lines. Dave highlighted this article from Runway Girl Network. Scroll down to the third picture in the main article (which is the 4th picture if you include the one above the article), captioned ‘Rockwell Collins ….’. I can’t reproduce it for copyright reasons and I can’t find any ‘official’ version. No airline has bought this seat yet, I think, which would give BA a bit of novelty value. The fact that it would appear familiar to AA and Qatar Airways flyers is another plus point in its favour. Let’s see. Air Belgium, which has been operating some Dubai and Abu Dhabi flights for British Airways in recent months, has got a more high profile contract. 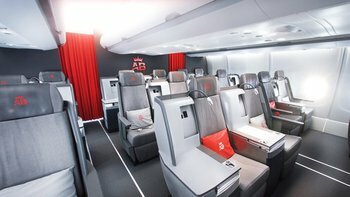 From 1st April to 8th June, BA184/185 from London Heathrow to Newark will be operated by Air Belgium. This is two class plane. First Class passengers who accept a downgrade to Business Class will get back the fare difference but retain access to The Concorde Room at Heathrow and receive First Class Avios and tier points. World Traveller Plus passengers can either have an upgrade to Business Class (free) or accept a downgrade to Economy, receive the fare difference and be guaranteed World Traveller Plus Avios and tier points. All passengers, even Economy, can request to switch to the 2nd daily Newark service which remains BA-operated. The Air Belgium aircraft is an ex-Finnair plane, see above, and arguably has a better seat than British Airways Club World although it is reportedly a little worn. This is another knock-on from BA’s Boeing 787-9 engine issues which have taken a number of long-haul aircraft out of service. As I covered last week, IHG Rewards Club will allow free night awards at its six new luxury Regent Hotels properties from 1st February. 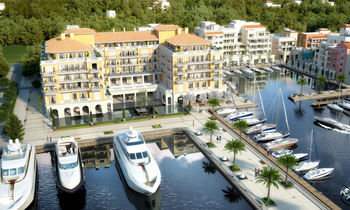 This seems reasonable, although Regent Porto Montenegro in particular is seasonal – you can find it for under €150 well into Spring, whilst I value 60,000 points at nearer £240 / €275. In July, however, you are looking at nearer €400. Regent Berlin pricing has similar swings. Before booking Berlin, however, do look at pictures of the bedrooms which are a bit Louis XIV, if you’re being polite, or a bit ‘your Gran’s bedroom’ if you’re not being polite. IHG Rewards Club is doing a ‘75% buy points bonus’ at the moment – see here – which, whilst not the higher bonus ever, is worth doing if you wanted to lock in a peak season trip to the above hotels on 1st February. I would expect availability to be good, at least initially, assuming that the hotels are obliged to put up 5% of their rooms as per IHG guidelines. OT as ambassador you should now get up to 20 usd credit for food/drink at an intercontinental? Anyone with a recent plat been able to get hilton gold? It’s been 4 weeks now and still waiting. When contacting Amex they say contact hilton and vice versa, just spoke to hilton again and I mentioned points as a goodwill gesture (quite annoyed now that I’ve had to speak to them so many times) and they said it’s against their policy to give points as goodwill?!? Why not try starting the whole process again from the amex benefits page? There doesn’t seem to be a way to reconnect accounts, it just shows pending. Why would they give you points for what they say is Amex’s issue???? Just upgraded a family member on Mon 28th and it took about 2 days. Got the account already showing as gold on AW. What might have made a difference is that it was a “fresh” new HH account, signed up to HH just before upgrading via plat. OT – AW emailed this morning saying quite a large number of my wife’s points will expire on 1st April but she’s had the SPG card since Sept. When I login into her Marriott account the amex points are actually posting as bonus points and at the top it says there has been No account activity posted for the past 30 days. I remember someone (sorry can’t remember who) was having the same problem. How did it get resolved? Would transfering the points to my account stop them expiring? It’s not the bonus bit that matters but if they are marked with a small star, MR points transfers are qualifying activity for example. Also my AW has the expiry date completely wrong the app and website as it as about 2 years time. Had a look at transferring them but it seems you now have to call up. Used to be quite handy being able to transfer SPG points online. How do i check the expiry? I’m logged into her SPG account (don’t get me started on the saga to try and combine her accounts) and don’t see anything about expiry date. All of the SPG Amex points transfers are marked with a star. So does that mean they are being picked up as qualifying activity? I posted up a weeks ago about this. Our 2 accounts both had SPG spend going in to them but the expiry was only to Feb 2020. I phoned SPG rewards and was told that as long as there was qualifying activity like SPG spend or MR transfer the points wouldn’t expiry. I didn’t try to explain that Award Wallet was not showing the right expiry date as I didn’t want to say my account details were with a third party. Shortly after that both accounts moved to an expiry of 20/12 but I have since had more SPG spend on 20/1 but the expiry date has not changed again. So not sure how to get this resolved. I have just deleted Marriott from AW and reinstalled it and it has reset both our accounts to the correct dates in Jan when our last SPG spend went in. I think we just need to keep an eye on these accounts as AW seems to not be updating the expiry dates on a monthly basis. As I mentioned yesterday, you can get round the ‘Spanish address only’ rule on the great Iberia half price Avios promotion just by changing your country of residence to Spain in your IB profile. Half price Avios redemptions on all IB, IB Express, Air Nostrum flights. Nice cheap TATL business redemption? OT: Do I still get the Amex Platinum baggage/airline delay cover if I pay with my personal nectar card (it has the Amex travel £50 off £200 on)? Do I have to keep the nectar CC open until the flight or can I close it? Yes you do. Not sure if you’d need to keep it open though. Also I booked the outbound with a 241 voucher, so how will the taxes be adjusted from 2x one ways to a return? That said, I tried to book the exact same flights a couple of weeks ago and could only get economy on the return. Rang up at 2350, was speaking to someone at 00.05 and got the last 2 economy seats. No CW. Male tends to be one of the hardest catches. I refreshed online at the stroke of midnight and never even saw CW pop up. OT – does anyone know if Principal hotels count as a brand on the IHG accelerate offer ? Amex Travel question: is it possible to do a mixed class booking online? The T&Cs of the travel offer (spend £600 get £200) seem to suggest that it is only via the online site, but can’t seem to find a way of pricing up different classes for a return (e.g. out Premium Econ, in Club). Any ideas? You could do it both ways in PY if you are sure there is reward capacity on J then pay separately for the upgrade. I think these offers from Amex are cumulative? No, can’t do mixed bookings..I have tried previously. Anyone know if you will be able to use the Intercontinental Ambassador Free Night Cert at a Regent hotel?